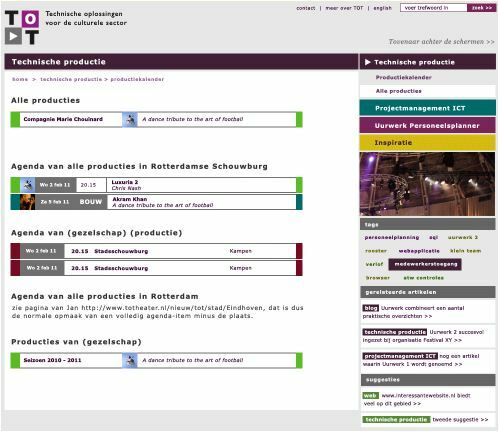 Uurwerk personnel scheduler: software for schedules and time tracking for events staff working in the cultural sector. From both a personal and professional interest, I have been active on the web since 1995. As such I believe I can be called a citizen of the digital world. In its early days, the Internet looked like a large collection of advertising brochures. Websites were shop windows, communication occurred by email. In fact, in the first house style design for TOT created by Jips Company in 2002, the web played no part at all. That’s practically inconceivable nowadays. A degree and a half, years of work experience and savvy of the worldwide web all combine to create a great package. However, my greatest source of inspiration has been TOT’s clients. They ask the questions and pose challenges, as a result of which my expertise is growing. This is why I have outlined a few of them on a separate page on this website. It is not that the other clients are not important, inspirational or interesting, but not every client likes that degree of attention. Or perhaps the page is not quite finished yet. On the client page you can read about what type of organisation they are, what TOT does for them and what the client means to TOT. You can see the client’s website, see their activities on various social media, and read their Twitter timeline live. The links at the top and bottom of the pages help you browse easily through the client pages. The order? The length of the business relationship with the client.